Drunk du Jour: up to date under the table. Numero Uno: A lot of the dishes at Yang’s are not going to win any Instagram beauty contests, including this one. It’s not as ugly as the dish of pork, noodles and preserved veggies (also super good, order it! ), but it’s only going to get about as many “likes” as that picture of your cat in which she looks rotund. This dish, “smoked meat wrapped in bread”, hits all the carby/sweet/tangy/salty bases. I wrote about it for the SacBee, in the brief window when I was writing here and there for them a couple years back. Tea-smoked pork! Numero dos: Above behold the cumin lamb roll. It’s listed on the wall with the specials. It hasn’t made it onto the paper menu yet. 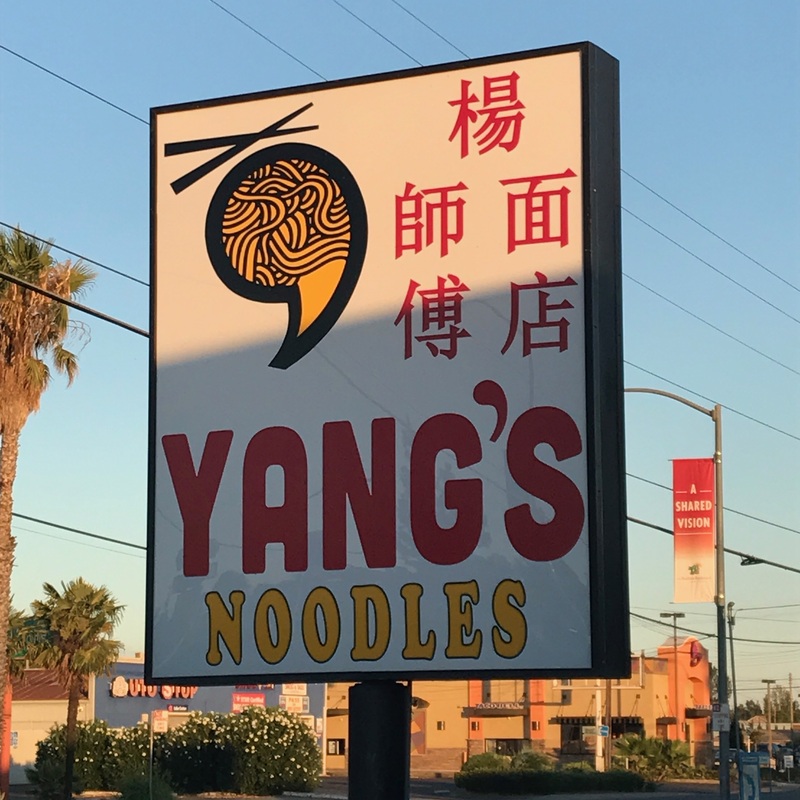 I couldn’t tell you when it appeared on the wall menu (which also has Dan Dan noodles – has anyone tried them here? ), or when it will make it onto the real one, but it’s worthy of inclusion. This one has more veggies than the smoked meat pancake, and lacks the sweet sauce. Lamb and cumin go together so well, and there’s cilantro in there too. Cilantro haters, I pity you. Numero tres: The beef roll. I didn’t know that there is some question about the provenance of the beef roll, which is outlined in this LA Weekly article. 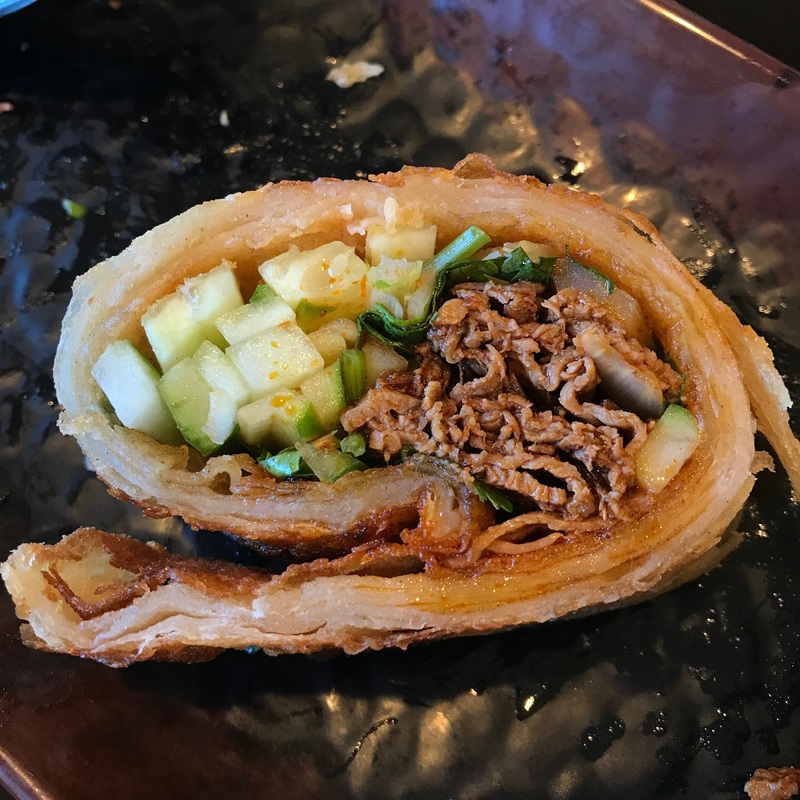 I first tried this dish at 101 Noodle Express in the San Gabriel valley – mentioned in the article as “the epicenter” of beef roll-ness. Friends who lived in SoCal took me there and my mind was blown. 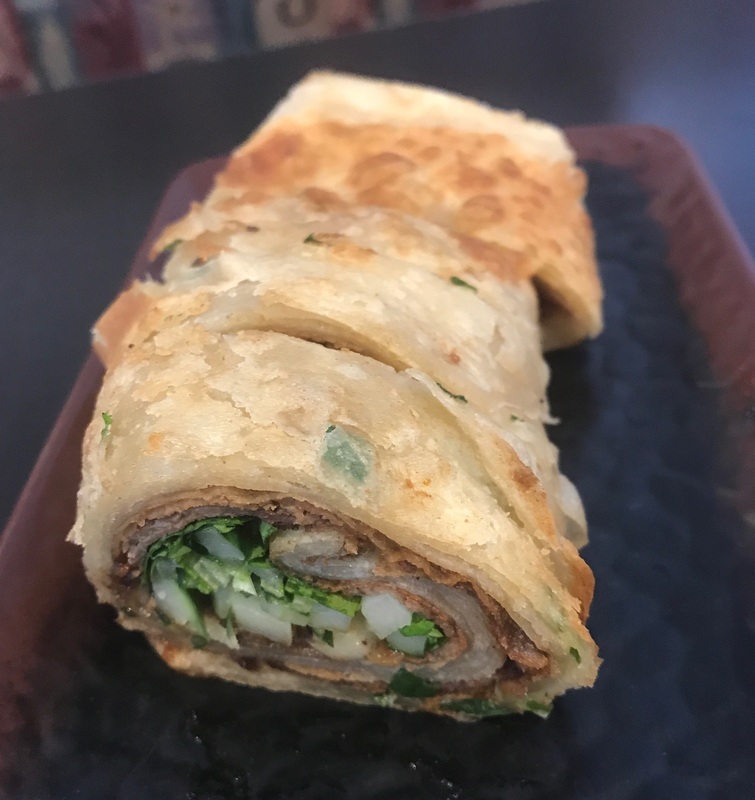 A Chinese burrito, but better! Never would I have dreamed that such a sophisticated culinary creation would come to Sac. This is why we’re already a world class city, people! It’s my least favorite of the three, but I still wouldn’t kick it out of bed. The beef is sliced so thin that you really don’t taste it. If you are vegetarian, try ordering it without the beef. I bet they’d do it, and it would still be just as good. 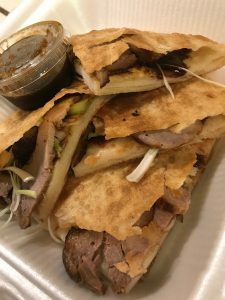 There are still a few more I need to try, like the sesame flatbread with beef, and the green onion and egg pancake. I will report back if the rankings change.